I'm willing to bet that you've seen the photo above at one point or another. It's a common fixture in history books and history-related websites, yet most people know nothing about the photo beyond the fact that it gives them vertigo when they view it. 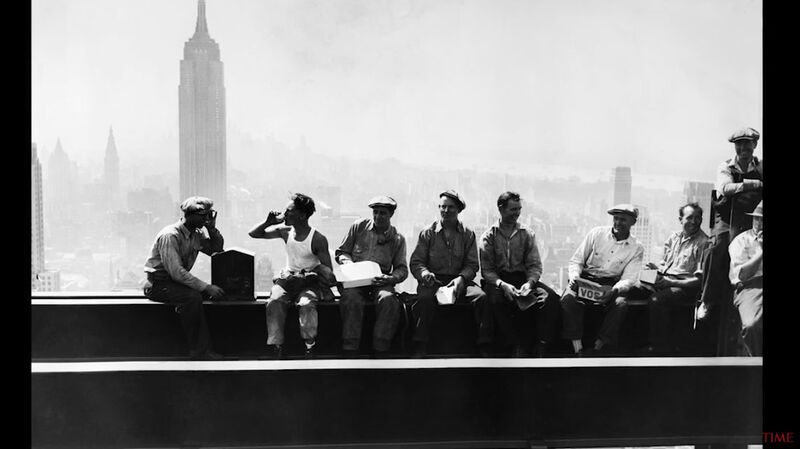 There are many misconceptions about this image - including that it was taken by Lewis Hine in 1932 at the unfinished Empire State Building in New York City. However, that's just not correct. Here's the story behind the iconic death-defying image about which most people know very little. One thing that's commonly said about this photo is that it was taken in 1932. That's correct. In fact, it was taken on September 20, 1932, during the height of the Great Depression. The image was first published in the New York Herald-Tribune on October 2nd, 1932. But what many people have assumed over the years is that the photograph was taken at the Empire State Building, when it was actually taken at 30 Rockefeller Center in Midtown New York. 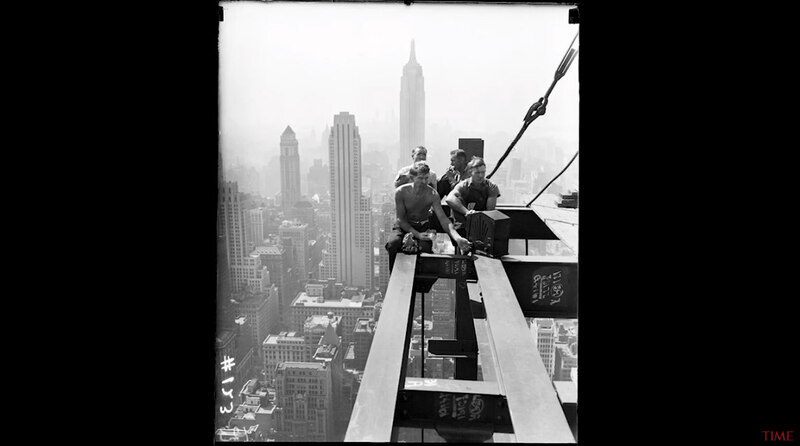 Because so many people erroneously believed that the image was of the Empire State Building's construction, credit for the photo is often given to Lewis Hine. That makes sense, though, because in 1930 Hine was commissioned to document the construction of the Empire State Building. 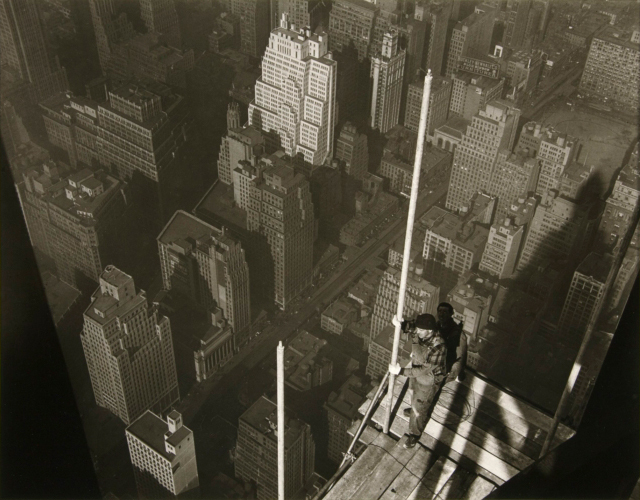 In the image above, Hine captured a worker raising the mast at the Empire State Building in 1932. You can see obvious similarities in the subject matter between the photo above by Hine and the featured image at the beginning of the article, so it's understandable why people might attribute both images to him. 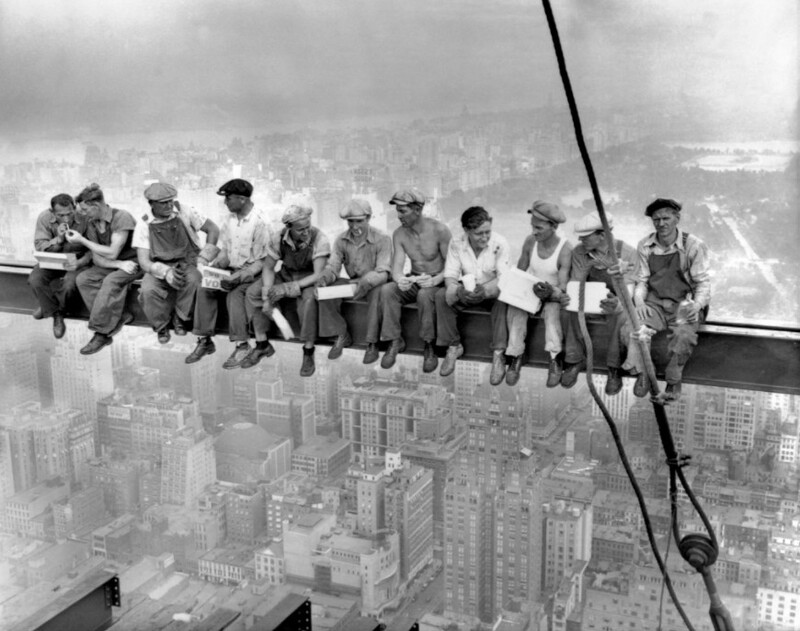 However, since Hine didn't document the construction of Rockefeller Plaza, the Lunch Atop a Skyscraper photo cannot be his. 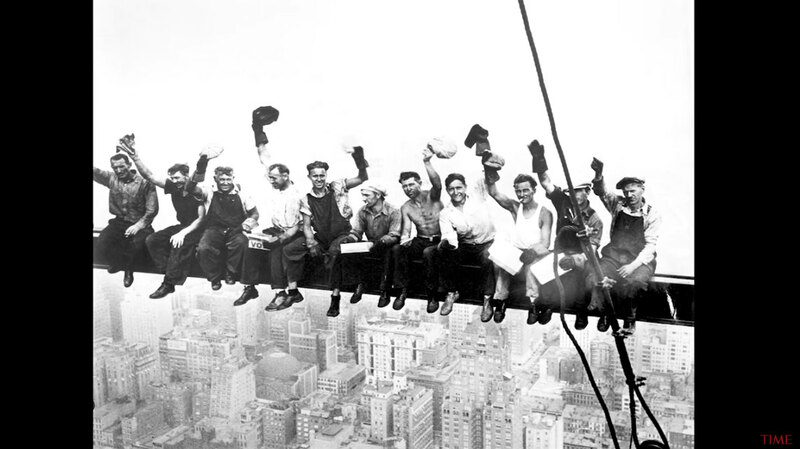 Many people believe that the image was taken by Charles C. Ebbets. Though, according to the New York Times, no one knows who took the photo. 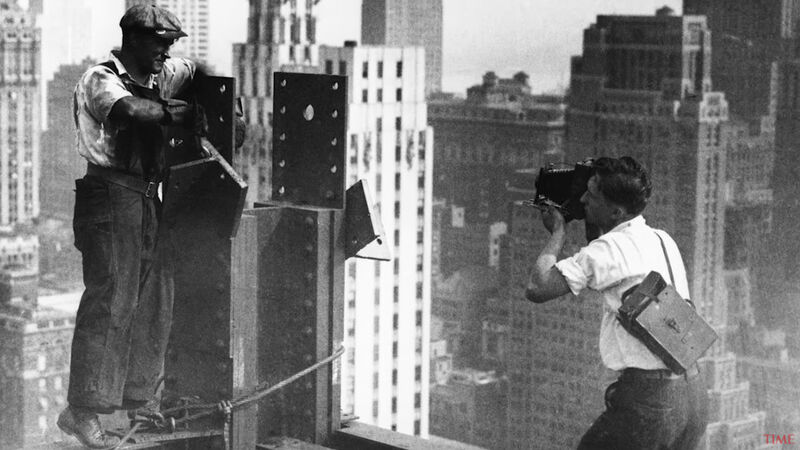 Ebbets is a logical choice for having taken the photo - he was appointed as the Photographic Director for the development of Rockefeller Center (the larger development of which Rockefeller Plaza is a part) in 1932 - the same year the iconic photo was taken. Furthermore, the Ebbets family claims to have verified records that prove their forebears took the photo. That includes the original receipt for Ebbets' work at 30 Rock on his professional letterhead. However, the Rockefeller archives list the famous image's photographer as "Unknown." That's because there were three photographers known to be on the site that day - Ebbets, William Leftwich, and Thomas Kelley. Whoever took the photo, they had to defy death to do so, just like the workers they photographed. In the image above, you can see how the photographer had to carry the glass plates for the camera in a leather case on his back. That meant switching out the plates as he stood hundreds of feet in the air on a steel girder. 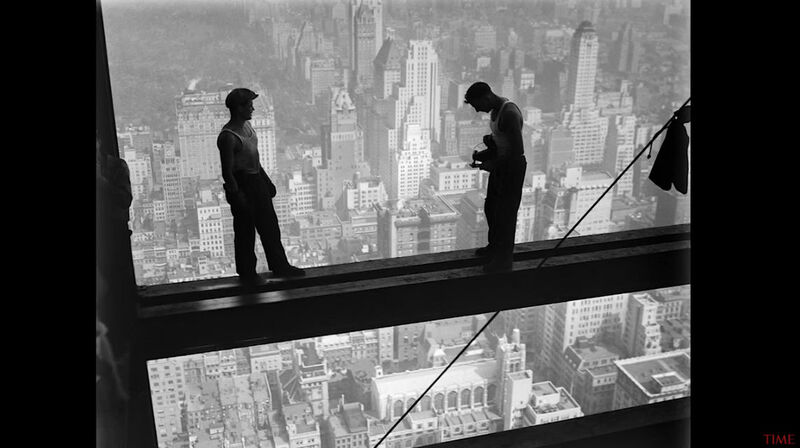 What is known about the photo is that it was taken on the 69th floor of the RCA Building toward the end of its construction. What is also known is that a completely finished floor was likely beneath the workers, just a few feet below. Even if the finished floor existed, the image is nonetheless terrifying to view, given that the workers aren't wearing any safety gear of any kind and that they are some 800 feet above the streets below. Perhaps even more interesting is that though the photo seems to document workers casually having lunch, there was nothing at all casual about the image. The photo was actually staged - as many photos of similar subject matter were at the time (including construction of the Empire State Building) - to promote real estate. There's also something to be said for publishing an image of men seemingly not having a care in the world during a time when so many people were suffering. In a larger sense, then, this image isn't just something that documents the construction of an iconic building; it demonstrates the resolve of humanity in the face of tough times. These workers risked their lives to earn money for their families at a time when money wasn't exactly easy to come by. 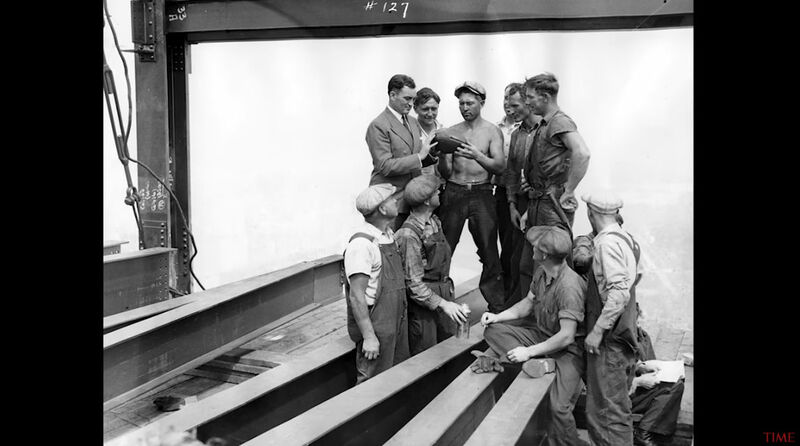 They were just eleven of the 250,000 people that had a hand in some aspect of the construction of Rockefeller Center. The photo also displays something else about America that's so wonderful - an incredible array of people from all sorts of walks of life coming together to accomplish a common goal. In the video above, Time Magazine explores the Lunch Atop a Skyscraper photo in more detail. 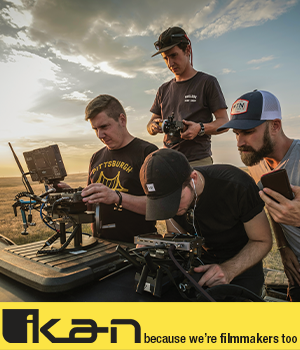 Have a look at the video to learn more and to see additional photos from the construction of 30 Rock.